“No refugees in orbit“ was a central slogan of the so called Dublin II-agreement, meant to regulate the proceedings of asylum applications. But the real effect is exactly the opposite: more and more refugees – including minors – are straying through Europe, fleeing from being deported to the countries of first arrival. They spend months or even years in various EU nations in the search for a country that will recognise their rights, and offer them a decent chance to experience a normal human life. Their first registration via fingerprint in the eastern and southern EU nations often leads to their doom. What at the beginning of the year was suspended for refugees, who entered Europe in Greece, is an ongoing problem with Italy, Malta or also Hungary, despite similar unsustainable conditions: constantly there is a threat of deportation to these nations of first registration when refugees continue their journey. “Europe wide we are observing a horrifying phenomenon: young refugees have to continue to flee. And this is due to fear of deportation to European countries in which their human rights as children are being trampled. Nobody feels responsible for these teenagers, who are displaced from one country to another,“ said Niels Espenhorst, speaker of the Federal Association for Unaccompanied Minor Refugees. Hungary is a classical transit country. Here cross the paths of those that hope to travel from the Ukraine to Western Europe, with those that flee from Greece over the Balkans. Rarely does one want to stay in Hungary, due to dramatic experiences they have seen themselves in the detention facilities. Homelessness, unemployment, lack of opportunity for raising families, failing educational opportunities and insufficient governmental financial support are defining parts of everyday life. The Hungarian authorities detain, almost without exception, every asylum seeker. And this includes those that applied for Asylum and have been deported back to Hungary under the Dublin II agreement from Germany or other European nations. Due to strong critique from various human rights organisations and the UNHCR, the draft asylum law from the end of 2010 was cancelled in regards to proposed “regular“ detention for minors without parents. In practice things look different. „We continually find visibly under-aged children who have been in Hungarian jails. Many are illegally detained and some are made on paper older than they are. Even those who have undergone medical age assessment, are highly likely to be older than age 18 by the time they are deported to Hungary.“ said Marion Bayer from Network Welcome to Europe. Apparently due to pressure from the EU, Hungary has intensified its detention system for refugees in 2010. Firstly, the detention capacity was raised, and then the length of detention was raised to 12 months. 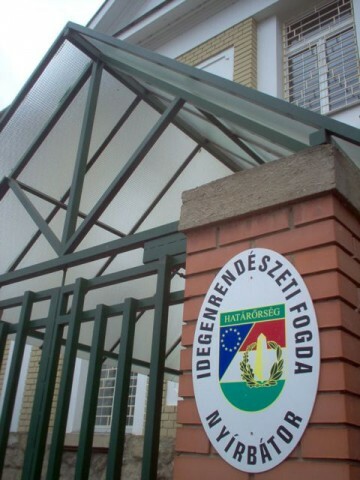 For the entire summer, there were massive protests and unrest in all Hungarian “Detention Centres“: Including Hunger Strikes and self-harm and continuous cases of police violence, as the Hungarian Helsinki Committee reported recently. In Kiskunhalas, a detention facility near the Serbian border, one entire floor was completely burned out in the course of a revolt against the inhuman conditions. In Nyírbátor, not far from the Ukrainian border, refugees were regularly given sleeping tablets to force them to keep quiet. Nyírbátor and Kiskunhalas are known to refugees as the “Hell of Hungary”.